The 4000 block of Wilshire—still fairly low-rise and actually sparse between tall office building districts to the east and residential neighborhoods just to the west—contains one of the last holdouts of the residential boulevard. 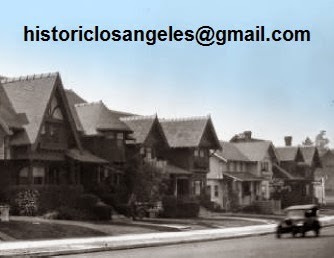 Given its urban vertical form and a description of its interior, one might wonder if the house was the remodeling of an older building moved to the lot from an easterly or southeasterly neighborhood of Los Angeles, from which relocations of even very large houses to newer precincts was not unusual in the 1910s and up to the onset of the Depression. Indeed, romantic lore of the family that moved into 4016 Wilshire in the mid-'20s has it that the house was moved west from Bunker Hill by its progenitor, attorney and real estate investor Elmer J. Neville; however, even if it had been relocated, not only would the original steep terrain of that downtown neighborhood have made such a move difficult, even with the building in pieces, city records indicate that 4016 was new construction built before the ownership of the Nevilles. 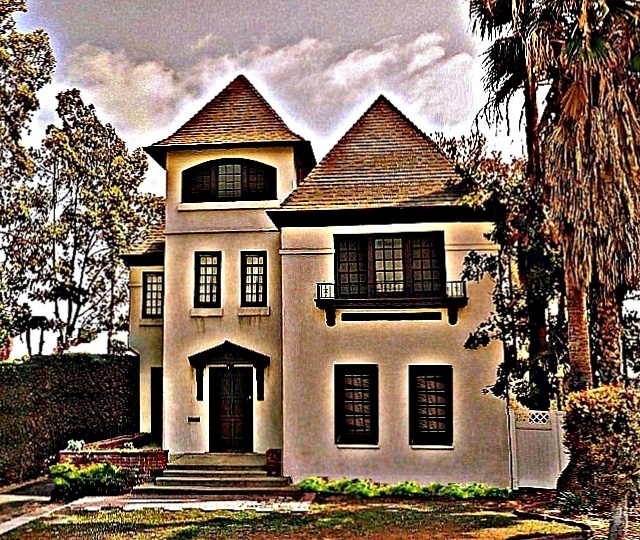 With a winter presence near San Diego, that clan was inching toward Los Angeles; still based in Omaha, the family had made its fortune there through banking and real estate investments—particularly in hotels, which on the death of patriarch James E. Neville in 1921 prompted the New York Evening World to describe them as Midwestern Astors. 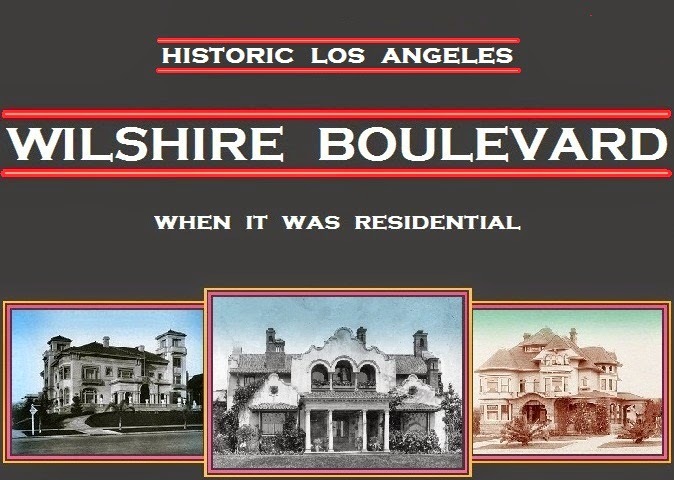 It might seem odd that a new house would have been built as near in time to the "fall" of residential Wilshire as 4016 actually was, but if anything, only the faintest bat-squeak of the boulevard's commercial future was being heard in 1917, and that far to the east. Perhaps not even the savviest of investors could have anticipated that trade would ever come out along Wilshire as far as Norton Avenue, and so quickly. 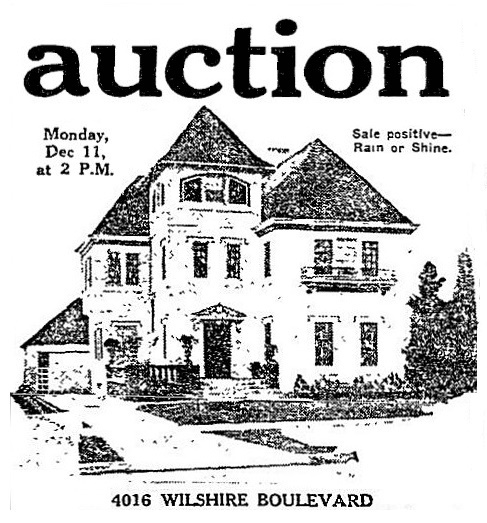 On November 24, 1917, the Department of Buildings issued permits for a 10-room, 35-by-58-foot house and a garage at 4016, on Lot 4 of Block 1 of the Norton Place tract; the subdivision had opened in 1905, although its Wilshire-fronting lots had been slow to sell. 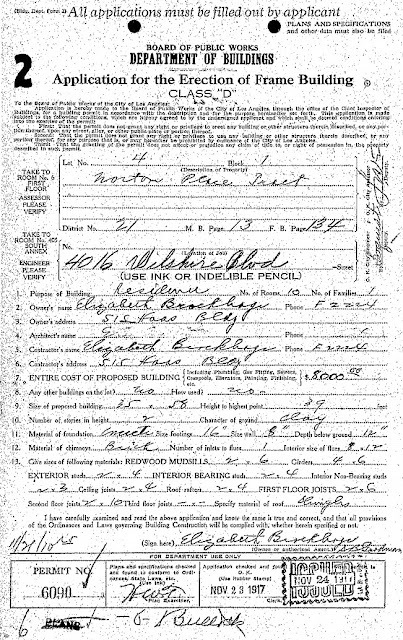 A curious name appears on the permits as the owner of the lot, that of one Elizabeth Brockhage. Though she gave her address in the permit information as the downtown office of real estate investor George Vandeveer Kirkwood, Brockhage was living at the time on Ingraham Street and working there as a maid, as she had been since arriving from St. Louis several years before. Kirkwood had been born to wealth in St. Louis; what, if any, Midwest connection there may have been between him and Miss Brockhage and how a domestic servant might have figured into the investment plans of Kirkwood is unclear, though a cynic might speculate that the house was a lavish payoff to avoid a heart-balm suit. As it turns out, less than five years after the completion of 4016 in 1918, a series of auction advertisements in the Times included the come-on that "This property will double in value in ten years or less. The city planning commission has already mapped out improvements for Wilshire Boulevard that will make it the finest boulevard in the country." Not mentioned but implicit was that the trend was commercial, not residential. It seems that George Kirkwood, if not his protégée Miss Brockhage, understood the potential of 4016 Wilshire quite well, as did Elmer J. Neville, though the latter with considerably longer foresight. The shrewd Mr. Neville very likely acquired 4016 at a bargain price, which, along with its long-term potential, would have been compensation for the house not being part of any cohesive neighborhood such as were recently developed and consistently planned nearby tracts including Fremont Place, Windsor Square, and Hancock Park, all hitting their strides by 1925. As seen in the Los Angeles Times on December 10, 1922, and, below, recently. along with a mint celebration cake from SuzieCakes that was enjoyed by all." occupancy after the family moved out, serves its original residential purpose. 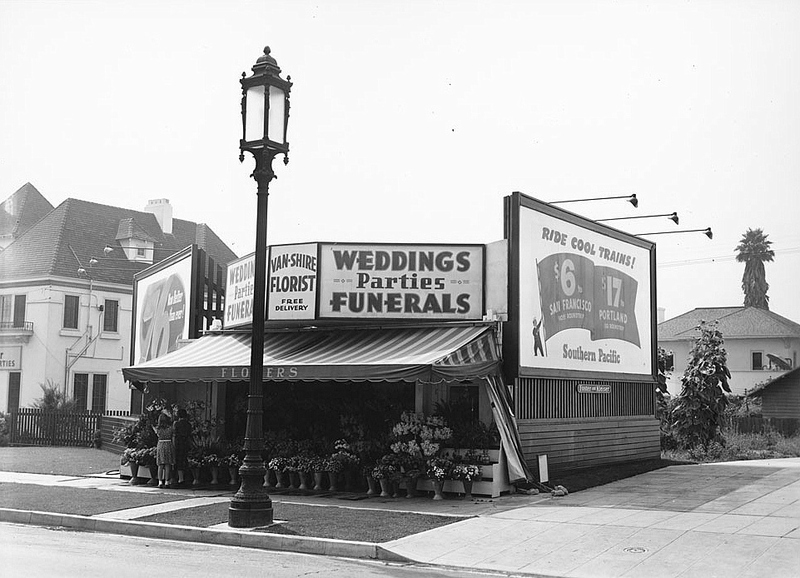 And yet, 90 years later, 4016 Wilshire still stands, and even more remarkably, without a sidewalk-fronting façade containing businesses, as do some remaining boulevard houses such as 2976 and 3944. According to county records, the house's official use is residential, even if over the years it has been listed in directories as the address of numerous commercial interests as well. The first commercial tenant, PTM Products—"manufacturers of toilet preparations"—was listed in the 1936 city directory. In 1956 alone, in addition to a resident by the name of Mildred Manning in an apartment on the second floor, real estate man Jackson Diggs maintained offices in the house, as he had since at least 1938; an insurance concern and at least one other business were also listed in the building in the '56 city directory. Another remarkable curiosity is that 4016 is still in the hands of the family that bought it around 1925—the directory of that year is the first in which the Nevilles appear. The Neville Family Trust might have done better sooner with a property farther east on Wilshire, but, given the rapid highrise Shanghaization of Los Angeles, prospective gains are likely coming soon. Although the family seems intent on maintaining 4016 as it was originally built, its potential, considering the rapidly changing fortunes of what is now the Koreatown neighborhood and the recent fate of the 99-year-old 3974 Wilshire in the next block—it has been demolished and is being replaced with an enormous seven-story mixed-use project—would seem to put sentiment in jeopardy. Perhaps the Neville family members now in charge of the trust overseeing 4016, who appear to divide their time between Northern Alabama and Brentwood, should they understandably decide to redevelop the property, will revive the trend that saved more than few original Wilshire Boulevard houses: While modern economics render the chances remote, perhaps one day 4016 will be picked up and moved west to a more stable residential neighborhood—perhaps even to Brentwood? Omaha native's family still owns it. As described both in the 1922 auction advertisements and recent real estate data, the 3,300-square-foot house has six bedrooms and three baths. The ads describe a den on the third floor in the short tower. An interior of solid mahogany of the best materials is mentioned, sounding more turn-of-the-century than post—World War I. While Elizabeth Brockhage and/or George Kirkwood may have built it, neither occupied 4016; it was railroad man (and before that, oil and grain man) John M. Neeland and his wife Katherine who were living in the house by at least 1921. 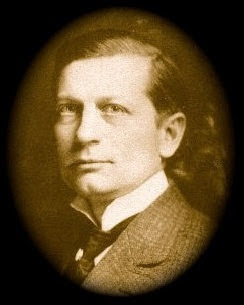 The circumstances that prompted the 1922 auction are not known, although ads refer to the owner as wishing to return to Canada, which is where Neeland had come from in the previous century. 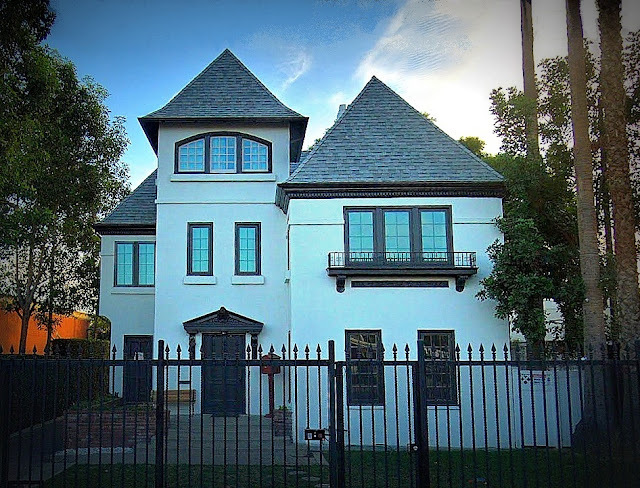 He and his wife were still in Los Angeles in 1930, however, living on Buckingham Road in rather exclusive, and distinctly noncommercial, Lafayette Square. After Elmer J. Neville and his wife Clara moved into 4016 circa 1925, it appears that the onset of the Depression, as well as the roar of wildly increasing traffic and the lack of a neighborhood feel, may have impressed upon them the wisdom of moving out of 4016 by 1935 and taking advantage of the boulevard's new commercial zoning by renting out space, first to dentist Harold L. Carpenter. While there are a few other original houses tucked away on the boulevard, none are in as apparent fine shape as 4016. How long will it last? has long since given up any illusions of being part of a residential neighborhood. taxpayer structure built flush to the sidewalk next door. 4016 issued by the Department of Buildings on November 24, 1917.